ALV Grid display looks quite different from List display. It has a grid output. Here in the Function Module REUSE_ALV_GRID_DISPLAY we have to pass program name, field catalog table and output table. We can pass layout for design purpose. For the top of page we don't have pass any event table here. We have to mention the form of top of page from the REUSE_ALV_GRID_DISPLAY function module. Inside that form we have to make internal table (say it_top) and then we have to pass that table in the function module REUSE_ALV_COMMENTARY_WRITE. TABLES: mara, marc, mard, makt. it_out TYPE STANDARD TABLE OF ty_out. PARAMETERS p_mtart TYPE mtart OBLIGATORY. MESSAGE 'Material doesn''t exist' TYPE 'I'. IF it_mara IS NOT INITIAL. IF it_marc IS NOT INITIAL. AND it_mard IS NOT INITIAL. LOOP AT it_mara INTO wa_mara. WITH KEY matnr = wa_mara-matnr BINARY SEARCH. IF it_out IS NOT INITIAL. DATA: lv_col TYPE i VALUE 0.
lv_col = 1 + lv_col. AND it_fcat_out IS NOT INITIAL. wa_top-info = 'Material Details Report'. wa_top-info = 'User Name: '. can anyone please help me in solving this issue. 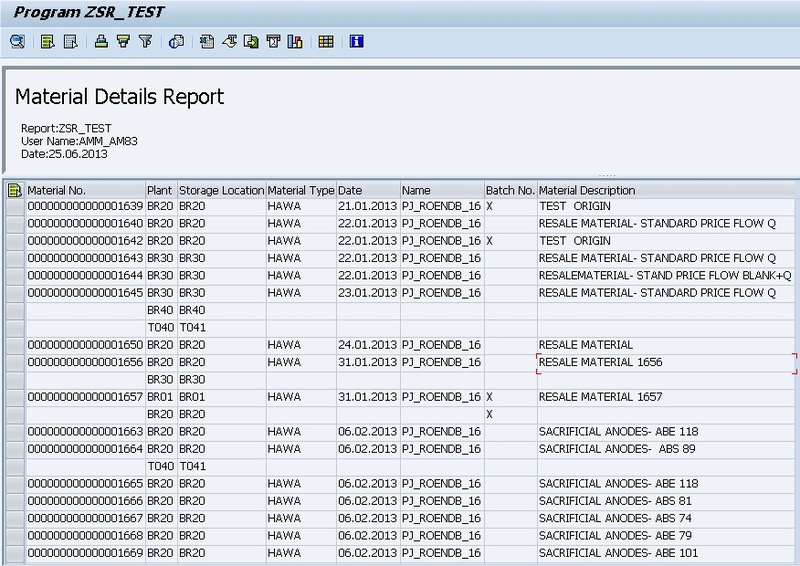 i am in need to create interactive alv report with fieldcatalogue, so could you please send me the abap code for this. thanks in advance.